Hero Coffee is tucked in this space between two bigger buildings at 22 East Jackson St. Chicago. I admit I was disappointed that inside there’s a tiny space with a couple counters to order. No more than 4 customers can comfortably fit inside. It made me miss China’s Maan Coffee, Toast & Waffles. A short film by François Truffaut, Antoine and Collette is a slightly melancholy look at Antoine Doinel’s attempt to get a girlfriend. First seen in 400 Blows Antoine has grown up left his neglectful, abusive home at 17. He’s on his own and works for a record company, where he gets lots of tickets to concerts. At one concert he sees Collette and immediately falls head over heels for her. She’s indifferent to him so there’s misadventures as Antoine tries to get Collette’s attention. Once they become chummy, her parents meet and take to Antoine. This will be the story of his life, girls’ parents, but not the girls themselves liking this well-meaning, rather lost boy. The film is touching and realistic and charms viewers in its 26 minutes. I wish it were longer and was glad to watch Stolen Kisses and see more of Antoine. Told by a several different narrators, all with different personalities and motives, Wilkie Collins’ The Moonstone entertains from start to finish. It begins with a family’s black sheep bequeathing a large, expensive jewel, the moonstone of the title, to his niece Rachel. The moonstone originally was a sacred jewel in India and three former Brahmans have come to England to get it back no matter what. Rachel receives the moonstone on her 18th birthday when many have gathered for her party. She flaunts the stone all night and then puts it in a cabinet in her bedroom. During the night it’s stolen. Who did it? The Indian jugglers, who came by out of the blue? One of the servants–particularly the maid who had been caught stealing by her previous employer? Or a guest who’s in need of money? It could be anyone and Collins keeps the surprises coming chapter after chapter. I enjoyed the humor and how the story was as much about the personalities of the characters and their relationships as it was about finding the culprit who took the cursed moonstone. I will soon read another Wilkie Collins’ story, that’s for sure. 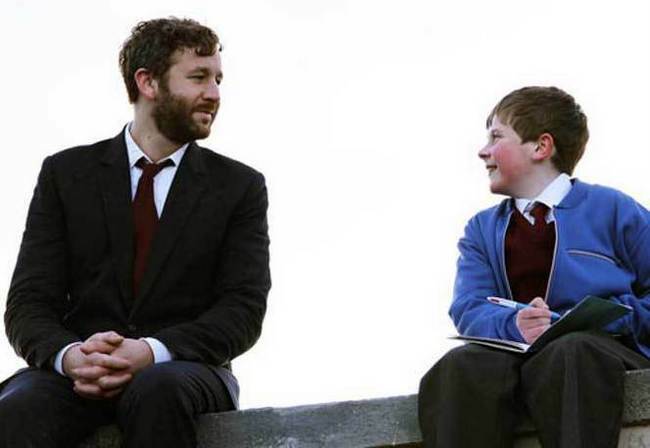 My new favorite comedy is Moone Boy created by Chris O’Dowd and Nick Vincent Murphy. In this Irish sitcom import, Martin Moone (David Rawles) is a twelve year old with a full grown imaginary friend named Sean. Martin lives with his shambolic family, which consists of his father who runs a sign shop, his mother who becomes Weight Wishers counselor and three older sisters who don’t like Martin at all. Martin needs someone in his corner and Sean helps him navigate the slings and arrows of school, romance, and family life. Set in 1989-90s, Moone Boy reminds me of The Wonder Years. It’s got wit and heart. The acting, particularly Martin’s performance, is natural and the pace is brisk. Each episode, available on Hulu.coma and PBS in some areas, wrings the most from every story. In the two seasons I’ve seen every episode delights. When I lived in Japan, I loved getting and sending New Year’s cards. That’s their big season greetings. You post your cards in December and the post office saves and sorts all the cards delivering all of them on January 1st.